Oh those tiny little white lights!!! Typically the first amazing sign of Christmas, but can also bring a warm and cozy feeling at any time of year! Check out some of these fantastic ways to add ambiance to any occasion...inside or out! White lights in trees during the summer bring a heightened stargaze effect to any event...whether you're planning a romantic dinner outdoors, gathered with friends, or simply having some quiet time alone...the soft lights are just mesmerizing! What about inside? 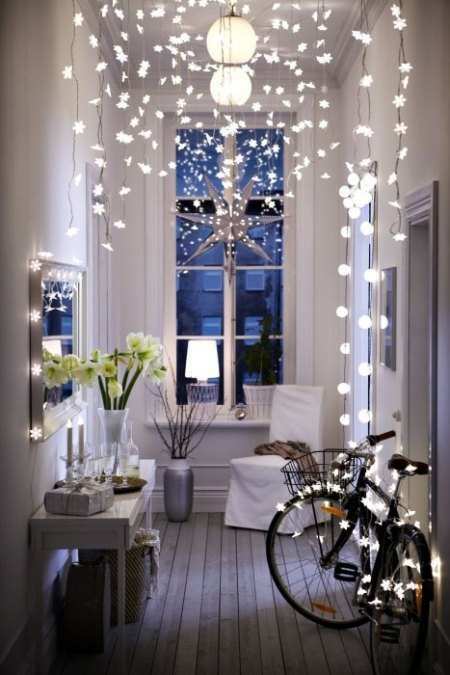 Bring the magic inside for an equally charming effect year round! Whether you decorate your bedroom, family room, or kitchen...you'll add a touch a sparkle and interest to any room! So pretty...let the lights dance with the twinkling of the stars and make your evenings just a little more special! Happy Decorating! Oh, and...Christmas is just 4 and a half months away, so you'll be all set for that, too!